In Thailand, there are vendors selling "Urban Decay N@ked 4", "N@ked 5" and so on. They have the branding, brush, spellings and text down to the last full-stop. The fakers were generous enough to offer a whopping 24 shades in the fake N@ked 4, while wisdom kicked in later and they stuck to 12 shades for the fifth edition. The quality of the fake palettes and their contents is a subject best left alone. A friend of mine visited Thailand recently and she tells me the shadows "smell of crayons". Both fake palettes cost a paltry $7. The counterfeiters might just have got away with it - if there had actually been a N@ked 4, with 24 shadows. The fourth original N@ked palette from Urban Decay is the N@ked Smoky, with 12 eyeshadows. I suppose the counterfeiters must be bemoaning their lack of patience. If they had waited, they could have copied the original design. 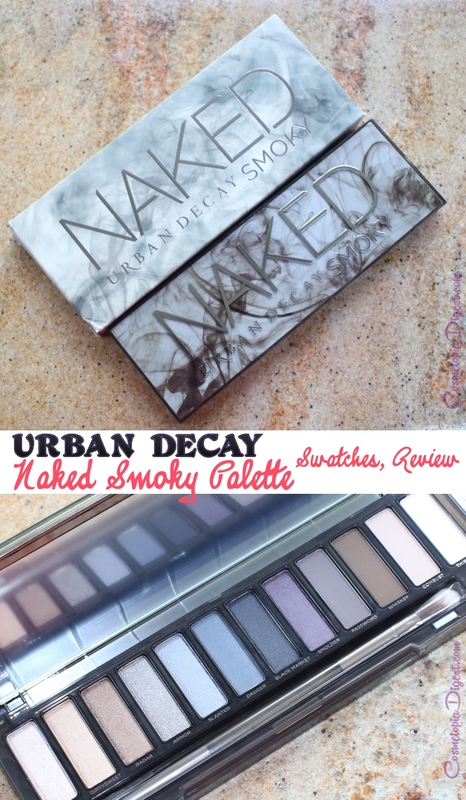 Here is the N*ked Smoky eyeshadow palette from Urban Decay, with swatches and my review. This has to be the best packaging from any Naked palette so far. If previous palettes had looked like this, I would have given them more love instead of relegating N1 and N2 to the back of my drawer. This is made of sturdy, translucent brown plastic and has smoke wisps on the front and the back. The magnetic closure has the best finishing we have seen from UD so far. Inside, you have 12 eyeshadows, a full-length mirror and a double-ended brush. I really like the brush. The wispy smoke features on the brush as well - look closely towards the ends of the ferrules. You also get a brochure with four eye makeup looks. Nine of these eyeshadows have never been seen before. Despite this being a smoky palette, not everything is silver and grey; there are bronzes, blacks and browns. Unlike previous Naked palettes, the eyeshadows are not arranged in order of lightest to darkest shades, but the deepest shades come in the middle while the four matte eyeshadows are arranged on the extreme right of the palette. Formula-wise, the shades are not very consistent. There was liberal fallout from some of these even when I barely ran a fingertip (short nails now). Combust and Thirteen, two of the paler mattes, tended to powder if I so much as waved in their general direction. High, Armor and Whiskey had a bit of fallout as well but swatched better and were far more pigmented than Combust and Thirteen. I also had difficulty getting Slanted to show up in swatches. I did not have any trouble getting Radar, Black Market, Dagger and Smolder to show up. And no, Smolder is not a true purple in real life, it is a browny-purple. On the palette, from left: High, Dirtysweet, Radar, Armor, Slanted, Dagger, Black Market, Smolder, Password, Whiskey, Combust and Thirteen. These are not swatched over primer (mostly because I'm too darn stingy to waste my HG Kat von D High Voltage on my forearm), and are swatched dry. BUT some of these are after multiple swipes. And you can see glitter from Armor on the edges of the photo, despite my attempts at cleaning up. Row 2, from left: Black Market, Smolder, Password, Whiskey, Combust and Thirteen. Combust (row 2, second from right) does not show up very well on my skintone. If that shade were a tad yellow and less red-toned, it would be a good foundation match on me. Slanted and Thirteen come out sheer despite packing on the colour. I really like Radar, Smolder and Dagger. Armor comes out well on my skintone despite the fallout while Black Market, though nothing new shade-wise, is pigmented. And the packaging is fabulous. But I'm not a fan of Slanted, Thirteen and Combust, while Password is so-so for me. The shadows in this palette are not very consistent, formula-wise. Surprisingly, I like the greyer shades better than I expected. Grey used to be a no-no for me, but I find myself liking Dagger. Next to Naked 3, this has colours I like. If you are NC37, yellow or olive-toned and worry that these are shades you cannot pull off, rest assured you can. Question is, do you NEED this palette? If you like these shades, are an Urban Decay collector, want all the Naked palettes, adore the packaging and live for smoky eyes (and don't mind fallout), then go for it. The Urban Decay Smoky Palette costs $54 in Sephora USA here, and £38 in the UK here, and here. Worldwide shipping is available from the last two links. Want it? Have it? Love it? Hate it? Tell me in the Disqus comments widget below. Before I leave, here is a laugh for you - "Urban Decay Naked 4"!! Warning: It. Is. A. FAKE. I neither buy nor condone manufacture or purchase of counterfeit products, and strongly urge readers not to buy either. Sellers also violate copyright and use bloggers' photos to sell their fake wares. I'm sharing this only for a laugh and to show you there are so many fakes around.